In the 1970s, in the Talamanca region of Costa Rica, a small diverse group of people came together and dedicated their lives to work toward integrating the wellbeing of nature and people. Talamanca is amazingly diverse, culturally and biologically. It is home to four indigenous groups, Black descendants of the Caribbean diaspora and campesinos from all over Costa Rica and Central America. Its rainforests, wetlands, rivers, and diverse family farms make Talamanca a true biodiversity hotspot. 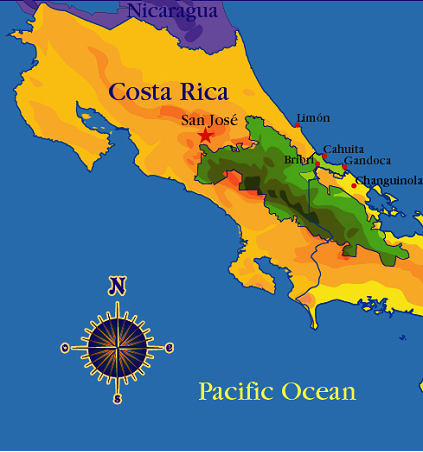 Costa Rica’s Institute of Biodiversity estimates this very small region (0.002% of the world’s land mass) hosts 4% of the planet’s land plants and animals. It is a microcosm of places all over the tropics where nature and cultures are being transformed, where the fate of the planet’s biodiversity is most at risk. ​The association began work on its own farm and small forest, slowly growing to include actions with neighbors. An initial focus on agricultural diversification and biodiversity conservation broadened to embrace a diversity of disciplines and initiatives important for community-based sustainable rural development. After a decade of practical investigation, learning and preparation, ANAI’s team set up the association with the mission to make tangible contributions to nature conservation, community centered development, biodiversity friendly livelihoods, strong community and regional organizations, and sustainability. Initial actions with the local community were scaled up over time to embrace communities from the entire Talamanca landscape. a) Do on the ground work with tangible conservation and wellbeing benefits. b) Be a voice for nature, local people, sustainability and future generations. ANAI’s team has always focused on doing things, on putting things into practice. ANAI endeavors to create opportunities that help people have a high quality of life, a mutually supportive relationship with nature, and an inter-generational commitment to sustainability, based on actions with real immediate benefits together with strategies to ensure these same opportunities will be there for their children’s children. ANAI is committed to human dignity, cultural respect and strengthening, sharing experiences and helping others integrate nature and human wellbeing. ANAI works for sustainability. A successful long term initiative, be it biodiversity conservation, agroforestry, processing and marketing of agricultural products, community ecotourism or environmental monitoring, needs to be biologically, economically, socially and organizationally sustainable. The future inhabitants of Talamanca and our planet need our generation to be successful in creating truly sustainable alternatives so that they too can live a wonderful life, enjoying a strong economy, productive livelihoods, healthy families and communities, and all of nature’s biodiversity and bounty. These are not sequential, nor distinct in practice. Each corresponds to a group of interrelated actions focused on generating tangible results, positive linkages between people and nature, and conditions for future success. None were planned out in their entirety when they were beginning. Each grew organically, guided by ANAI’s strategic objectives and core values. Each step forward creates new opportunities, new allies and new challenges. The ways the association has worked are extremely varied, influenced by the goals, needs, opportunities, people, circumstance, place and resources. What remain constant are the commitment, agility, creativity, stubbornness and clear vision of thriving communities caring for thriving nature. Early years. ANAI’s early history had two phases – a founding phase from 1971 to 1978, followed by a five year period of growth, diversification, learning and preparation. Creation of the 10,000 hectare Gandoca Manzanillo Jairo Sandoval National Wildlife Refuge, protecting its forests, sea turtle beaches and RAMSAR recognized wetlands of international importance. More than 90% of the neighboring communities’ farm families obtained clear legal title to their land. Diversification and strengthening of family farms in more than 50 communities, making them organic, Fair Trade and more sustainable. The creation and growth of one of the world’s largest organic small farmer, mostly indigenous cooperatives. The Aquatic Biomonitoring and River Conservation Initiative. The first sustained stream biomonitoring program in the humid tropics began around 2000, following many years of research on the freshwater habitats of Talamanca by ANAI’s founder Bill McLarney. Its mission is to better know and protect the streams of the La Amistad Caribe region, in the context of their watersheds. Contributions Beyond Talamanca. ANAI’s diverse experience has created opportunities to support people and nature in other places. This has become an integral part of ANAI’s approach. The Agro-Ecology and Sea Turtle Conservation Programs trained thousands of eco-volunteers and interns in on-the-ground research and conservation work. Many went on to work in conservation and development programs around the world. ANAI has been a leader of the Costa Rica SGP Program for Conservation and Sustainable Development since its inception in 1993. The CR-SGP is widely recognized as one of the world’s best national level programs working with communities to integrate nature conservation and livelihoods.